Fire dependent pitch pine (Pinus rigida Mill.) and scrub oak (Quercus ilicifolia Wang.) barrens are found on coarse-textured, droughty soils in the northeastern United States. These communities are globablly rare and, in many areas, dependent on active management to sustain them. We used historic and recent aerial photographs of the Central Pine Barrens in New York to develop transition matrices and trajectories of vegetation change. A vegetation map for 1990 provided pre-burn cover type information for a 1,200 ha area burned by an extremely severe wildfire in August 1995. Geographic information system analyses, a fire- history study, post-wildfire research and existing literature provided additional information for development of three conceptual models that describe our understanding of vegetation change in response to fire and land clearing. A simulation model was then used to predict the amount of each cover type in 2046. The reasonableness of the prediction was assessed based on our understanding of pine barrens vegetation dynamics. 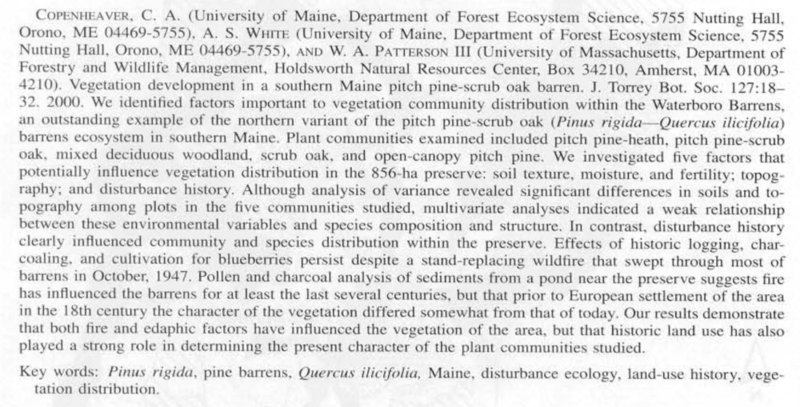 In 1938, following a period of frequent, intense wildfires of the region, 90% of vegetation in the study area was open canopy barrens (including dwarf pine plains, pitch pine–scrub oak woodland, heath, pine–heath woodland, and scrub oak shrubland). Between 1938 and 1994, wildfires decreased in size, the average area burned per year generally declined, and there were no fires in 70% of the study area. As a result, barrens decreased to 􏰁45% of study area vegetation. In August 1995, an unusually severe summer wildfire converted 810 ha of woodland and forest into scrub oak shrubland, and increased barrens to 60% of study area vegetation. Most areas of heath and pine–heath, which comprised 24% of barrens vegetation in 1996, are successional types that developed on formerly cleared land. In the absence of extensive burning, we expect barrens vegetation to be converted to closed- canopy forest as coppice trees and new seedlings mature. Recent changes in fire regimes are likely to result in a loss of barrens vegetation that exceeds predictions of the simulation model. Careful use of prescribed fire and/or mechanical treatments to simulate the effects of fire are recommended for future restoration and maintenance of pitch pine barrens, and for protection of human life and property. A New Jersey Forester explains how pine snakes, though a threatened species, have co-existed and thrived in managed forests. Evaluating the impacts of southern pine beetle on pitch pine forest dynamics in a newly invaded region. Southern pine beetle (SPB), a native insect that has historically affected pine ecosystems in the southeastern U.S., has recently expanded northward causing extensive tree mortality in pitch pine and pitch pine-oak forests across much of eastern Long Island, NY. Multi-scale analyses of wildland fire combustion processes in open-canopied forests using coupled and iteratively informed laboratory-, field-, and model-based approaches. Skowronski , N. et al. Manuscript in preparation. Multi-scale analyses of wildland fire combustion processes in open-canopied forests using coupled and iteratively informed laboratory-, field-, and model-based approaches. Abstract: The goals of this research are to: 1. Improve understanding of the processes driving heat transfer, ignition, thermal degradation, flaming and smoldering combustion, mass consumption, and fire propagation at the scale of individual fuel particles and fuel layers in low-intensity surface fires; 2. Develop an understanding of how fuel consumption is affected by spatial variability in fuel particle type, fuel moisture status, bulk density, and horizontal and vertical arrangement of fuel components in low-intensity surface fires; 3. Increase understanding of the effects of multi-scale atmospheric dynamics, including ambient and fire- and forest overstory-induced turbulence, on fire spread and convective heat transfer in low-intensity surface fires, and; 4. Ensure that the measurements undertaken support the development and validation of physics-based fire behavior models using an iterative approach consisting of laboratory, field, and model simulations.